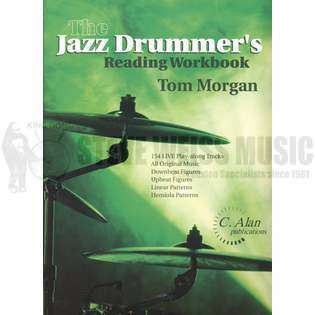 The Jazz Drummer's Reading Workbook by Tom Morgan provides written sequential exercises that gradually add new figures and longer summary etudes, all contained on 2 play-along CDs. Without a rhythm section and ensemble to play with, it is easy for a drummer to make errors without knowing it. The goal with this book is to give drummers a chance to play musical examples similar to what they will encounter in the "real world." Big Band/Lrg Combo in one. If you're wanting to be able to read out of the Goodwin books, this is a definite first step. I have been performing jazz for a small number of years compared to most, I have gotten to the point where band leaders let me count off the charts. My teacher gave me this years ago and I have such graduated. Buy this if you're serious. This book is full of progressively more challenging ensemble figures up for interpretation. It's great practice for learning to read big band charts (a few of which are included with play-a-long tracks). There are tracks for each of the exercises with and without drums, so you can hear how it's done and pick up some fill ideas as well. Overall, an excellent book.